Barry, Cisco and Harry travel to Earth-2, in order to save Harry's daughter. Barry and Cisco know it's going to be a whole new world yet are still stunned to find just how different it is - particularly when they find out that Caitlin is a super-villain in this world and that Ronnie - also a villain - is still alive. Meanwhile, the Caitlin they know and love must help Jay Garrick to fill Barry's boots when a new villain called Geomancer attacks Central City. The Flash #123 - "Flash Of Two Worlds" (the idea of Earth 2 and Barry traveling to it), Firestorm #3 (Killer Frost's origins and original concept), The JSA comics of Geoff Johns (Geomancer), the mini-series Brightest Day (first appearance of Deathstorm) and the mini-series Forever Evil (The New 52 origin for Killer Frost, whose name was Caitlin Snow, as well as Deathstorm). Quite honestly, the whole cast do an amazing job playing their alternate universe counteparts. There's a lot of great performances in this episode, but this is Danielle Panabaker's time to shine. She's clearly enjoying herself playing the vampish Killer Frost and it showcases a side of her we haven't seen on the show. But she gets her licks in as the Caitlin we're familiar with, helping Jay Garrick get back into fighting shape. Candice Patton doesn't get much to do as Iris (as per usual) but there's a definite toughness to her character as Earth-2 Iris that was sorely lacking when Iris tried to confront the gangster running the illegal street races last week. It's proof Patton can play strong with the right script. It's a quick moment, but Grant Gustin's non-verbal acting during the conversation Barry has with the Nora Allen of Earth 2 may be the best bit of work he's ever done on the show. I know the show's creators have just been looking for an excuse to give Jesse L. Martin a chance to sing. I hope they'll find another one in the future. The more I see of Bart Sears as Jay Garrick, the more I hope for an Earth 2 based JSA show in the future. Finally, Carlod Valdes proves he can play sinister just as well as he plays comic relief during his brief but scary turn as Reverb. Great special effects all around. The make-up design for Killer Frost is a good one. Expect to see her at a lot more cons. The concept of Earth-2 dates back to The Flash #123. In this comic, Barry Allen accidentally traveled between worlds and arrived in the reality where Jay Garrick was The Flash. This would be the first of many team-ups between the two heroes and, later, the Justice League and Justice Society. There were several differences between the Earth 1 and Earth 2 of the comics realities - chief among these being that superheroes with the same code names but different origins existed on each Earth. The Green Lantern of Earth 2, for instance, got his powers from a magic lamp whereas Earth 1's Green Lantern gained his powers from an alien artifact. The DCTVU version of Earth 2 has numerous differences from Earth 1. These will be cataloged in the Continuity section below. When passing between the barrier between Earths, we see flashes of various alternate realities. The visuals here are similar to those when Barry traveled in time or between realities in the comics. The images of other worlds that we see as Barry and company travel to Earth 2 include an image of a Green Arrow who is dressed slightly different than the one on Arrow, a vision of The Flash from the 1990 John Wesley Shipp series, an image of Supergirl from the CBS Supergirl series, Jonah Hex - an Old West hero (who is slatted to appear in Legends of Tomorrow's first season), Gorilla Grodd (who was sent to another Earth in F207) and a Legion of Superheroes flight ring. Harry's talk about Earth 2 having a different vibrational frequency than Earth 1 is taken directly from The Flash #123. There, it is explained that the various Earths exist in the same place in Space and Time, but vibrate at a unique frequency that separates them in the fifth dimension of probability. The Earth-2 Barry Allen seems to have a fondness for bow ties. In the comics, Barry Allen also prefered bow ties when he dressed formally. The villain Killer Frost was introduced in Firestorm #3. Originally she was a student of Professor Stein's named Crystal Frost, whose feelings of love he did not return. A lab accident turned her into a heat-vampire, who drained the warmth from living bodies and then projected cold and ice outward. She fought Firestorm on many occasions, eventually dying after she attempted to absorb too much of his energy. She was replaced by a second Killer Frost - Dr. Louise Lincoln - who had been a friend of Crystal Frost and blamed Firestorm for her death. She replicated the accident which gave Crystal her powers and picked up where her friend left off. The New 52 version of Killer Frost was named Caitlin Snow. She was a STAR Labs scientist stationed at an Arctic research lab, who was similarly transformed into a heat-vampire after a lab accident. She became obsessed with Firestorm after discovering that his energy blasts somehow temporarily cured her condition. 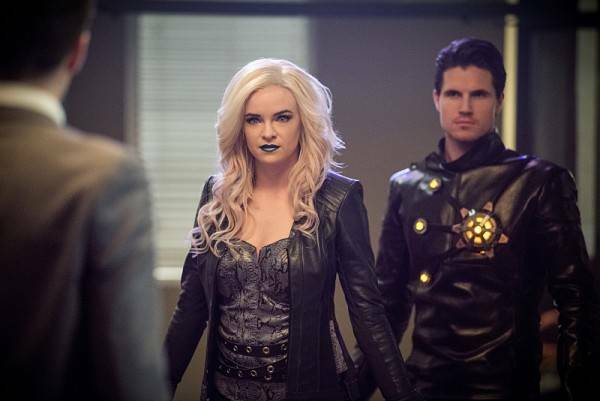 The DCTVU version of Killer Frost is the Earth-2 version of Caitlin Snow. She has the same ice-projection powers as her comic book counterpart and can kill people just by touching them, freezing them instantly. Her preferred method of doing this is kissing them. She is romantically involved with the Earth-2 version of Ronnie Raymond (aka Deathstorm), whose powers make him the only man she can touch safely. The original Deathstorm first appeared during the Blackest Night storyline, where a number of dead superheroes were resurrected as the zombie-like Black Lanterns. Deathstorm was born of the corpse of the then-deceased Ronnie Raymond, who had been the physical component of the first Firestorm. Deathstorm appeared again in the sequel series Brightest Day, where it was revealed that Deathstorm had taken shelter inside The Firestorm Matrix and was still active, plotting to destroy all life in the universe. Deathstorm was also the name of Firestorm's evil counterpart from the dark mirror world of Earth-3 during the Forever Evil storyline. On that world Martin Stein was an evil scientist who performed horrible experiments on living people. He experimented on himself, merging himself with a dead body and unlocking terrible powers in the process. The phone in Barry's house on Earth-2 has speed-dial buttons for people named Eddie, Bruce, Hal and Diana. These are likely references to Eddie Thawne, Bruce Wayne, Hal Jordan and Diana Prince. Eddie Thawne, of course, was Iris' fiancee on Earth 1 and apparently is still a close friend of the family. The other names are the secret identities of Batman, Green Lantern and Wonder Woman from the comics. In the comics, Geomancer was a mercenary named Adam Fells with the power to shape and control earth and stone. He was also able to cause earthquakes. He first appeared in JSA #5, where his efforts to drive an African tribe off of their ancestral lands were thwarted by the similarly powered JSA member Sand. He later reappeared as part of The Injustice Society, apparently hired on to counter Sand's powers. One of the songs Joseph West sings is My Funny Valentine. When this episode first aired, it was just before Valentine's Day weekend in 2016. The song is also apparently Ronnie Raymond and Caitlin Snow's song on Earth 2. A reference is made to Geomancer being spotted on Pasko street. This may be a nod to writer Martin Pasko, who has written a number of comics and cartoons based on DC Comics properties. The trick where Jay Garrick combines his speed and his helmet to create a focused sonic vibration blast comes directly from the comics. The evil Earth-2 version of Cisco Ramon goes by the code name Reverb. In the comics, this was the codename used by Vibe's brother - a former gang leader who developed the same superpowers, reformed and became a superhero to honor his fallen brother. The wavelength trigger of Cisco's Vibe goggles isn't responding because the frequency is imbalanced. This is due to Earth 2 vibrating at a different frequency than Earth 1. Jay: Do not get distracted by anything you see along the way. Cisco: What are we going to see? Killer Frost: Where do you people get off robbing Central City's Royal Bank? This town belongs to Zoom. And those of us he deems worthy enough to enforce his will. Robber One: Here! Take it! Killer Frost: (digging through the bag of money) Thanks a million. Or should I say two? Second Robber: Please! Don't hurt me! Killer Frost: Hurt you? I just want to give you a kiss. Deathstorm: Now what did I tell you about watching that behind? Killer Frost: (purring) I thought that was your job? Killer Frost: Good thing the only man I can kiss is the only one I want to. Deathstorm: Just got word some Breachers came through. Killer Frost: Mmmm. You know my favorite thing to do is kill people from other Earths. Deathstorm: Today's your lucky day. Jay: Caitlin, I like the way you look at me. With warmth and pride. And I'm not... I'm not worthy of those. Jay: No, I did a terrible thing, Caitlin. When my world's particle accelerator went off, I became a speedster. I became the fastest man alive. Only... only it wasn't enough for me. I wasn't... I wasn't fast enough! So I figured that with my scientific background I could increase my powers... and I did. Caitlin: So you've taken Velocity-6 before? Jay: Yes. But there were some unforeseen side effects. Caitlin: This is why you didn't want Barry to take it? Or even know about it. (pauses) Zoom never stole your speed? Caitlin: This is what's making you sick. Velocity-6 is killing you. Jay: I wasn't lying when I said that stuff was dangerous. (sighs) I've made so many mistakes. Caitlin: Well, you have something now that you've never had before. Me. And I'm going to figure this out. Joseph West: You ever notice, every time, just before I do a number, I close my eyes for a hot second and I take a deep breath? You ever wonder what I was doing? Iris West-Allen: Trying to remember the words? Joseph West: (laughs) I say a little mantra to myself. Every time before I sing. "This one is for Irish. My baby girl." Every song's for you baby. Every single one. Jay Garrick (having just flored Geomancer with one punch): I heard you were looking for The Flash. Geomancer: Is that all you have? Jay Garrick: You don't ever want to see all I have. Vibe: I can't believe you two work for Zoom. Reverb: (from the shadows) No. They work for me. I work for Zoom. Vibe: Who the hell are you? Reverb: (laughs) Well that's funny. I was just about to ask you the same thing. Killer Frost: Stop! Both of you! Zoom wanted him alive! You know what Zoom will do if you don't obey him! Zoom: What did I say you should do if you encountered a speedster? Zoom: (gesturing to the beaten Barry) Does this look unharmed to you? Zoom: I'm happy to see that at least one of you knows their place. Barry closes all the breaches, save for the one in the basement of STAR Labs. The Central City of Earth 2 has more of an art deco influence to its architecture and most of the people that we see tend to dress in 1940s fashions. Despite this, the city has high-speed trains traveling around the city on elevated monorails and the technology of Earth 2 is far more advanced than on Earth 1. The Earth 2 version of Henry Hewitt is a nice guy who is employed at STAR Labs. The Earth 1 version appeared in F204 and became the villain Tokamak. A news report makes reference to Mayor Snart. This last name may be a coincidence but it seems likely that the Earth 2 version of Leonard Snart went into politics rather than crime. The Earth 2 Barry Allen is still a CSI with the CCPD. However, he differs from the Earth 1 Barry in that he earned his doctorate and wears glasses. The Earth 2 Iris West is a Police Detective with the CCPD. She also goes by Iris West-Allen, having married Barry several years earlier over her father's objections. The mural in the Earth-2 CCPD lobby reads "A Fair And Just Society" and seems to be a nod to the Justice Society of America from the comics as the lobby mural on Earth-1 is a nod to the Justice League. The Earth 2 version of David Singh is a snappily dressed crook, as opposed to his Earth 1 counterpart, who is a Police Captain. The Earth 2 version of Floyd Lawton is Iris West-Allen's partner and was given the nickname Deadshot ironically as he has the worst aim of any police officer in the CCPD. On Earth 1, he's a deadly assassin known as Deadshot. Earth 2 Barry and Iris live in the same house that Barry lives in with Earth 1 Iris and Joe. Nora Allen - Barry's mother - is still alive on Earth 2. Earth 2 Barry bought his parents tickets to Atlantis, which was reported to be a popular vacation spot by Jay Garrick in F205. On Earth 2, Jitterbugs is a piano bar where Joseph West performs. It appears to be in the same location as the Earth 1 coffee bar C.C. Jitters, where Iris worked. The Earth 2 Joseph West is a lounge singer. He does not get along with Earth-2 Barry, considering him a selfish man who forced his daughter to give up a better life as a reporter to become a cop so she could pay his way through college. The Earth 2 version of Geomancer is dead and Jay Garrick recognizes him on sight. Jay Garrick confesses that Zoom did not steal his speed. Rather, he began losing his speed powers as a side-effect of his own efforts to boots his powers with the Velocity-6 formula on Earth 2. Joseph West dies as a result of his injuries in the fight with Killer Frost and Deathstorm. The Earth 1 version of Adam Fells had convictions on robbery and assault charges before he became a metahuman. Caitlin creates a new Velocity 7 drug to restore Jay's speed. It works for a time but quickly burns out of his system. By episode's end, she's already at work on a Velocity 8 formula. The Earth 2 versions of Caitlin Snow and Ronnie Raymond are still romantically involved, albeit evil. Deathstorm says, when questioned about Martin Stein, that Stein doesn't say much anymore and that he hasn't let the old man out for years. The Earth-2 version of Cisco Ramon has the same powers but is evil and working as Zoom's right-hand man. He calls himself Reverb. Reverb has a greater control of his powers than Vibe and is capable of unleashing focused sonic blasts that can kill a man. Zoom kills both Reverb and Deathstorm, leaving Killer Frost alive since she objected to Deathstorm attempting to kill The Flash. The way in which Reverb dies mirrors the alternate timeline Cisco's death from 115. Central City on Earth 2.